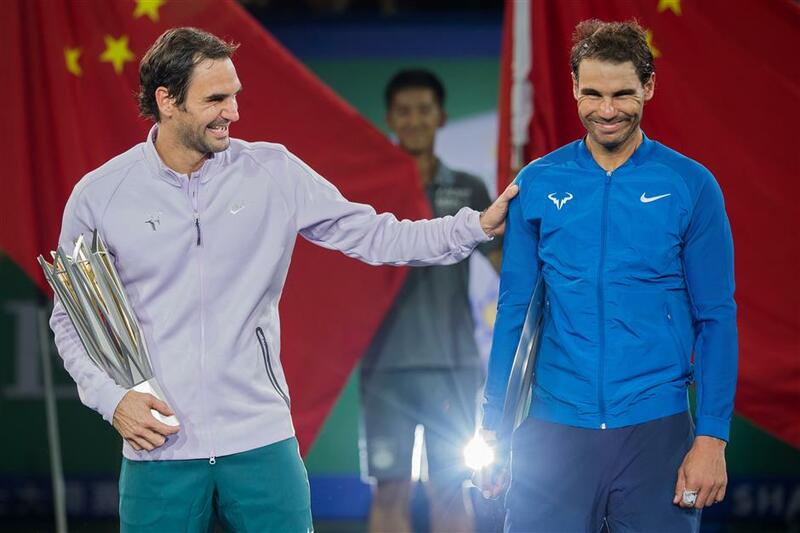 Winner Roger Federer (left) of Switzerland and runner-up Rafael Nadal of Spain react as they hold their trophies after the men's singles final of the Shanghai Rolex Masters in this October 15, 2017, photo. World No. 1 Rafael Nadal's preparations for next month's Australian Open have suffered a blow after he was a late withdrawal from the Brisbane International tournament on Thursday. The 31-year-old Spaniard has not played since he withdrew from the season-ending World Tour Finals in London in November with a knee injury. He had already withdrawn from an exhibition tournament in Abu Dhabi that starts later on Thursday. "I am sorry to announce I won't be coming to Brisbane this year," Nadal said on his Twitter account. "My intention was to play but I am still not ready after last year's long season and the late start of my preparation." The Brisbane tournament starts on Sunday. Nadal, who also cancelled a training block last week, returned from injury last year to reach the final of the Australian Open and win the titles at the French and US Opens. He played in Brisbane last year as part of his preparations for Melbourne Park and made the quarterfinals before losing to Canada's Milos Raonic. "I had a great time there (in 2017) and it was a great start to the month I spent in Australia," Nadal added. "I will be seeing my Aussie fans when I land on the 4th in Melbourne and start there my preparation for the Australian Open." The Australian Open runs from January 15-28. Meanwhile, former world No. 1s Andy Murray and Novak Djokovic are relishing their return to competition after serious injuries cut their last campaigns short, but the overriding aim for both players in the New Year is to stay fit and healthy. Murray, who has struggled with a persistent hip injury since the Briton's quarterfinal exit at Wimbledon in July, pulled out of the US Open and dropped to 16th in the world rankings. The 30-year-old is scheduled to participate in the Brisbane International as he gears up for the Australian Open, but a season blighted by injury has changed the double Wimbledon champion's outlook. "When I was fit and healthy last year (2016), you think about winning all the major events, getting to No. 1 and winning every competition that you are in and that is what drives you," Murray told Sky Sports. "When you miss four or five months and there has been a bit of uncertainty about my hip (that changes). The goals change and I remember now how much I loved playing tennis — it isn't about winning every match I play in the future or winning more slams. "I want to get back to playing tennis, I want to be fit and healthy and that is what is driving me just now... I was pretty unhealthy for most of this year and I am getting there but it is a slow process." Djokovic suffered a year-long dip in form before an elbow injury forced him to retire in the Wimbledon quarterfinals. The Serb has not played competitively since and underwent surgery. "It's been a real roller-coaster ride for me for a year and a half with this issue," world No. 12 Djokovic told Sport360 in an interview ahead of his return at the World Tennis Championship in Abu Dhabi. "I've never had surgery in my life, I've never had any major injuries that kept me away from the tour for such a long time... I've learned a lesson because I really want to avoid getting to that stage of an injury ever in my career after this. "I can't wait to get back on the competition level but it was a great experience for me to have. And it was a somewhat necessary experience because I got maybe too comfortable with not having major injuries."